This book — a collaborative effort by members of the Society for American Baseball Research (SABR) — evokes memories of the Astrodome. Heralded as the “Eighth Wonder of the World” when it opened in 1965, the Astrodome was the world’s first domed stadium. Readers are introduced to the stadium’s history through detailed summaries of 70 games played there and nine insightful feature essays about the ballpark. Some of the games might be considered great, like Nolan Ryan’s record-breaking fifth no-hitter, or historic, like the first regular-season game in the ’Dome. Other contests are remembered for outstanding or milestone accomplishments, such as Jim Wynn becoming the first player to hit three home runs in the Astrodome, or fantastic finishes like the Astros’ 22-inning victory in 1989. Stories from 35 years of Astrodome history feature Hall of Famers like Ryan, Bagwell, Craig Biggio, and Randy Johnson, as well as stars from Larry Dierker and Mike Cuellar to José Cruz and Mike Scott, and lesser remembered or forgotten players, such as George Bjorkman. No volume would be complete without the Astros’ heartbreaking losses in postseason games in the 1980s and 1990s. Feature essays contextualize the stadium’s history, with pieces on the Astrodome’s engineering, the major movers and shakers in the early stages of the stadium’s creation (including Roy Hofheinz, George Kirksey, and Craig Cullinan), the Astrodome as a home to non-baseball events, and of course, an in-depth historical review of the Astrodome itself. Astrodome icons, pitcher Larry Dierker and longtime team executive Tal Smith, wrote introductions for the volume. Contributors include: Mark Armour, John Bauer, Frederick C. "Rick" Bush, Alan Cohen, Rory Costello, Richard Cuicchi, Larry Dierker, Greg Erion, Dan Fields, T.S. Flynn, James Forr, Gordon J. Gattie, Paul Geisler, Chip Greene, Matt Henshon, Brent Heutmaker, Michael Huber, Chuck Johnson, Norm King, Justin Krueger, Bob LeMoine, Len Levin, Bill McCurdy, Bill Nowlin, Chad Osborne, Thomas Rathkamp, Alan Reifman, Richard Riis, Rick Schabowski, Mark S. Sternman, Jim Sweetman, Joseph Thompson, Robert C. Trumpbour, Steve West, Tal Smith, Mike Whiteman, Gregory H. Wolf, and Kenneth Womack. E-book: Click here to download the e-book version of Dome Sweet Dome for FREE from the SABR Store. Available in PDF, Kindle/MOBI and EPUB formats. Paperback: Get a 50% discount on Dome Sweet Dome paperback edition from the SABR Store ($15.99 includes shipping/tax). 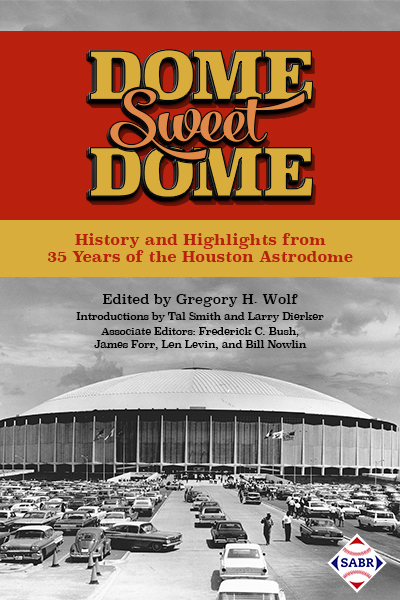 E-book: Click here to purchase the e-book version of Dome Sweet Dome for $6.99 from the SABR Store. Available in PDF, Kindle/MOBI and EPUB formats. Paperback: Get the paperback edition of Dome Sweet Dome from the SABR Store ($30.99 includes shipping/tax). For more than 40 years, SABR and its members have led the way in publishing the best baseball historical and statistical research. Our publications program is shifting to take advantage of new methods of publishing. Not only will we continue to publish new books like Can He Play? A Look At Baseball Scouts and Their Profession (released in December 2011); Opening Fenway Park in Style: The 1912 World Champion Red Sox (May 2012); Detroit Tigers 1984: What A Start! What A Finish! (December 2012); Sweet '60: The 1960 Pittsburgh Pirates (April 2013); Inventing Baseball: The 100 Greatest Games of the 19th Century (July 2013); Thar's Joy in Braveland: The 1957 Milwaukee Braves (May 2014); Detroit the Unconquerable: The 1935 Detroit Tigers (December 2014); Winning on the North Side: The 1929 Chicago Cubs (February 2015); Scandal on the South Side: The 1919 Chicago White Sox (June 2015); The Team That Time Won't Forget: The 1951 New York Giants (December 2015); Nuclear Powered Baseball/The Simpsons (February 2016), Au jeu/Play Ball: The 50 Greatest Games in the History of the Montreal Expos (April 2016); Cuban Baseball Legends (July 2016), and Baseball's Business: The Winter Meetings: 1901-1957 (December 2016), which showcase the best efforts of SABR's members, chapters and committees, but new technology makes it possible for us to bring out-of-print titles like Run, Rabbit, Run: The Hilarious and Mostly True Tales of Rabbit Maranville (February 2012), Great Hitting Pitchers (March 2012), Nineteenth Century Stars (August 2012); Batting (January 2013); The Fenway Project (September 2013); and '75: The Red Sox Team That Saved Baseball (April 2015) back again. This page was last updated October 31, 2017 at 3:51 pm MST.